I got a call from a potential client yesterday. He had been referred by someone I didn’t recognize. That person must have known of me thanks to my blog. After the conversation, I sent a proposal. He told me he had worked on Wall Street and had been trained that it was never good negotiating to take the first number. He asked if my fee was a typo. He told me that my price was 40% higher than all the other consultants he’d spoken with. Then he asked me for free advice to solve the problem he clearly wasn’t willing to pay me to solve. Not only wasn’t this guy going to pay my fee, but he wanted me to solve his problem. And by applying the good lessons you’ve taught me over time, I saved myself needless suffering. Instead of telling him how to solve his problem, I confirmed my price for the project, told him I had a client meeting to attend, politely excused myself, and ended the conversation. I doubt he’ll call back, but that’s not the point. One proposal, one short follow-up conversation. That’s the end of it. I didn’t give anything away, I didn’t waste my time, I didn’t beat myself up. I simply went on with my life and used my time productively. 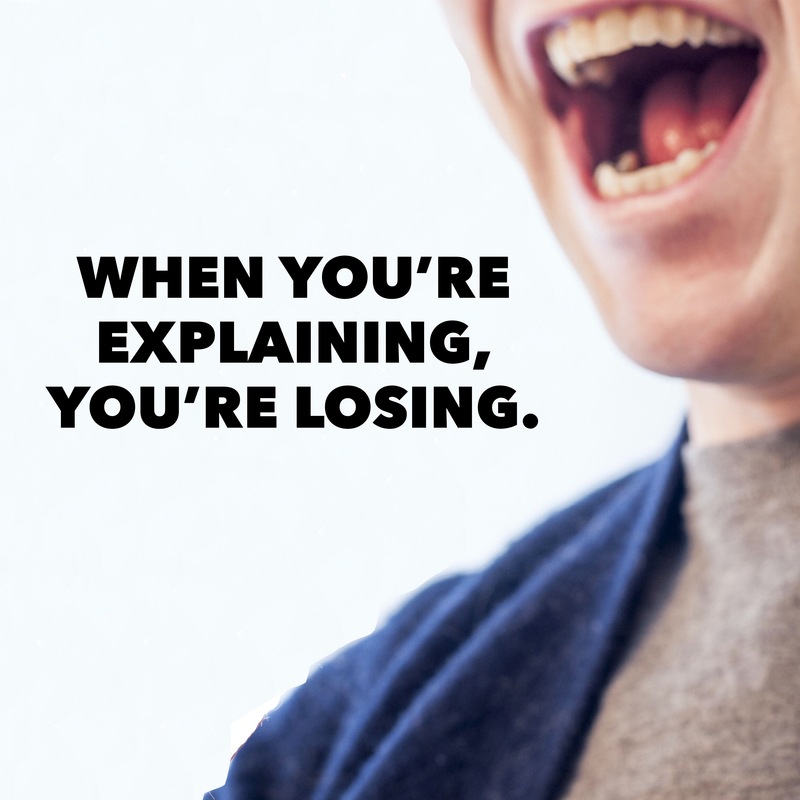 “When you’re explaining, you’re losing” works in business, politics, advertising, brand building, and relationships. Following that simple adage reminds you to be intentional and focus on what matters most.